We are leading Manufacturers & Exporters of Customized conveyor systems as per the application. We have inhouse facilities for design, development, design validation & fabrication. 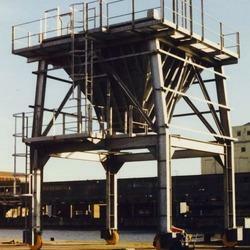 In addition we can also fabricate conveyor systems and other MS structures as per the project drawings. We can work on basic process flow diagrams & design & fabricate suitable conveyor systems or we can follow detailed project drawings to carry out fabrication of conveyor systems. We have over 30 years of experience in design & manufacturing customized conveyor systems. Our ISO 9001:2008 systems certified workshop is fully equiped with fabrication equipments and is located in Noida (Delhi NCR). 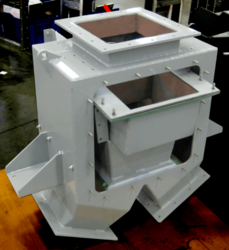 We manufacture customized Mobile Feed Hoppers for various feed applications. Our mobile hoppers are precisely designed with proper chute angles and using topmost grade material and advance technology in tandem with the set quality norms. We manufacturer Spiral Chutes as one the cement plant spares machinery. 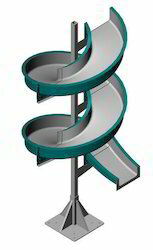 Avail from us the wide range of Spiral Chute. We manufacture these as per the defined industry standards. We with our quality assured range provide utmost satisfaction to our valuable clients. These are suitable to ensure gentle handling of products that are more prone to damage while conveying. We are recognised as the renowned manufacturer and supplier of the superior quality of Industrial Chute. These technically advanced ranges of chutes are widely used in various industries for material handling. We are giving these chutes in assorted customised options as per the requirements of our clientele. The door automatically closes and locks after contents have been dumped and have a built in release cable that may be operated from a safe distance. This hopper can be secured and moved easily with assistance from a fork truck and features durable steel construction with a blue painted finish.